Sully is THE main character (fight me about it later) of the Monsters Inc and Monsters University Movies. These movies strike a chord with me as the initial Monsters Inc was my favourite movie as a child and just as I had grown up and moved towns to go to university Monsters University was released - with inconceivable timing! This piece of art is quite... big. And it also scares me. See the size of the dumpster for comparison. The more realistic impression of the teeth and the eyes gives me the heebeejeebees. I think it is an excellent judge of Sully's character (as is Mike's ((see below))). Here Sully is doing his scare thing with an obvious look of sadness in his eyes as his character is developing into someone who thinks scaring children isn't a justifiable way to make energy. (Watch the movie). In terms of professionalism, the artist has done a wonderful job: the reflection in Sully's eyes, the cleanliness of the lines, the mixing of colours (especially in the background! ), the fluffiness captured... all top notch stuff. Mike is on the otherside of the Lion.... Just worth a mention. 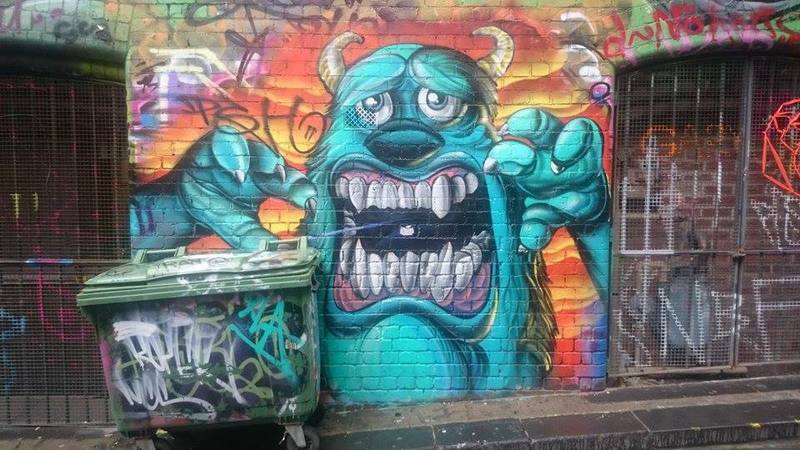 “2,” Street Art deTours, accessed April 24, 2019, http://streetartdetours.com/document/1024. 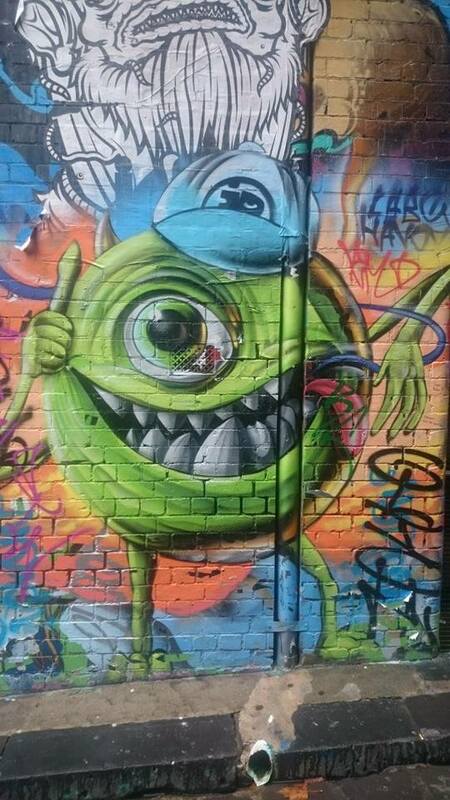 I watch and read too many cartoons and I see them everywhere in Hosier Lane. Help!